Want a consistent player who is likely to be a POD? Jack has a Cat who could fit nicely into your midfield. For the last two seasons now Mitch Duncan has been one of the most consistent Fantasy Footballers around. He only failed to score more than 90 three times during the home and away season, with scores of 70, 79 and 83. What you get with Duncan is a player who will get you a score of 110 more often or not, week in week out. Whilst Duncan had a better year in 2017 averaging over 110, last year there was a drop off due to Mitch playing deeper in defence, leading to him taking some of the kick in duties for Geelong. With the rule changes for kick ins this season, expect Duncan to pick up plenty of extra +3s when given the opportunity to kick it in. Something we have seen from Geelong is the willingness to give Duncan a role around the ball. When it is not in the defensive line he is often starting at the midfield bounces giving him ample opportunity to get the ball. But the most enjoyable thing about owning Duncan is his ability to junk. He goes from an average score of 80/90 to 110 on almost all occasions that the Cats are winning games. In-fact, the three games he failed to score over 90 came in games where the Cats lost. Duncan average 106 in wins and 93 in losses, showing how much extra points he gets when the Cats are on top. The equation is simple, if the Cats win games, Duncan will score points. Something not discussed is the chances of Duncan gaining DPP as a Defender. As mentioned he spent a lot of time down back last season. If that is to continue he could pick up DEF status early this season, which would be very handy with a lack of defensive depth. One of the most frustrating things with Duncan is with the ability to junk, he should be scoring scores of 150+. His highest score last season though being 136 in the final game of the season on the back of a 29 possession, 9 tackle game as Geelong won by over 100 points. He is a player that can easily get 30 touches a game, but he often misses the chance to land a tackle, and quite often misses chances he needs to take in front of goal if he is to get high scores. The other worry is if Tim Kelly is given greater time in the midfield. 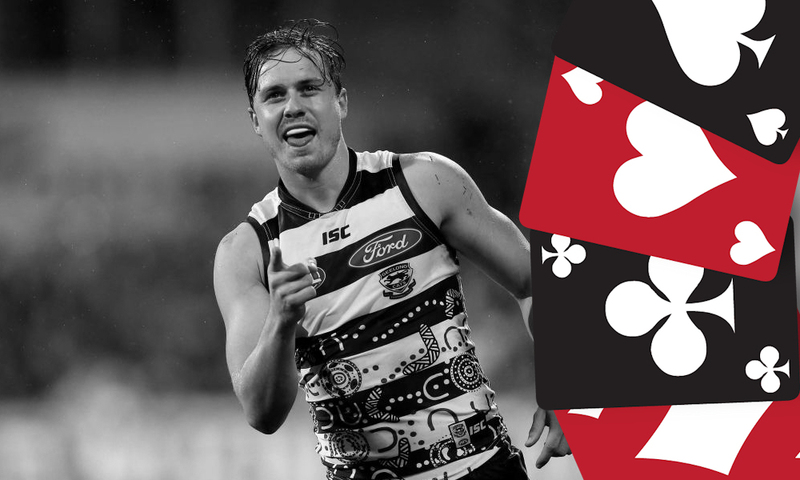 With Kelly coming in to his second year the Cats will be eager to give him more time in the middle and at centre bounces. With guns such as Selwood, Ablett, Dangerfield, Menegola and the addition of Dahlhaus someone has to be pushed out of that midfield on occasions, and I fear Geelong will be happy enough to move Duncan into a Half Back role similar to what Docherty plays. Now a role change like that can be a good thing, as we all know the position benefited Docherty’s scoring, but it is yet to be seen what it means to Duncan’s role, and question will remain going into the pre-season. JACK –If it is consistency you are after then Duncan is certainly the player for you, but at over 700k, and as just a MID is there better options? With the changes to the kick in rules it is hard to see if Duncan will see an increase in his scoring potential. A move further back could see an increase on his potential to junk, but less midfield minutes with the addition of Dahlhaus, and Kelly in his second year could see a decrease in goal scoring and tackling potential. It is certainly worth tracking Mitch in pre-season though, as this will hopefully give us an idea of how he is to be used this season. FOLLOW ME TWITTER: @Triggywiggy for all thing AFL Fantasy (and more). Got something to say about the deck? Use the hashtag… #DeckofDT.